Curating Biocultural Collections: A Review. Edited by Jan Salick, Katie Konchar and Mark Nesbit. 2014. Kew Publishing. Royal Botanic Gardens, Kew. In association with Missouri Botanical Garden, St Louis. By Jan Freedman, Curator of Natural History, Plymouth City Museum and Art Gallery. It may appear rather unusual for a natural history curator to review a book on ethnographic collections. However, with a plethora of crossovers from similar storage conditions to comparable conservation methods, this book may potentially be more beneficial than you may first think. 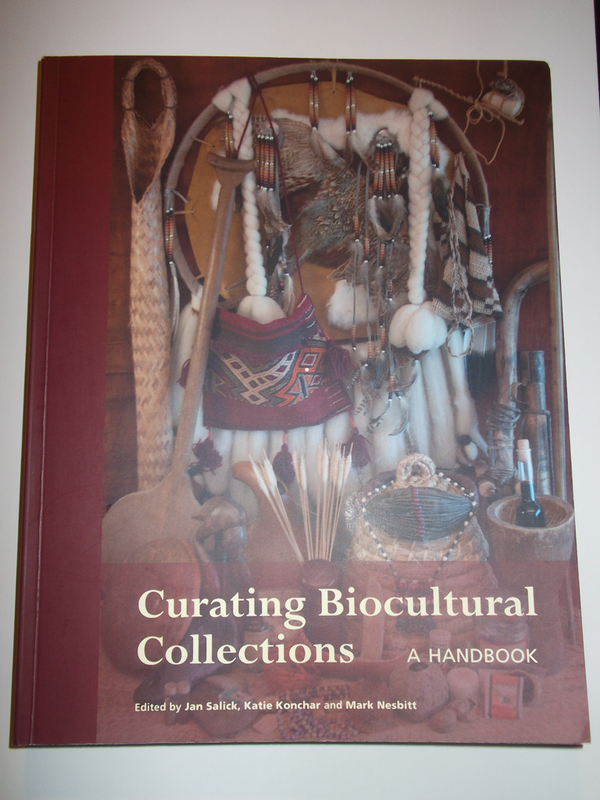 I was interested to review this book because I am not an expert on biocultural collections. I am keen to see if this book would be useful to assist with the diverse natural history collections we care for. Biocultural (ethnographic) collections include any object made with the parts (or whole) of animals or plants. This can include herbarium collections, clothing, animal artefacts, DNA collections, skeletal collections, and many more. These collections provide wonderful evidence of cultures past and present and how they all relied on their natural world to survive; as we still do today. Due to their very nature, these collections require analogous collections management with natural history specimens, and many specimens in our collections cross over (eg. Herbarium, wood samples, etc). The book itself is well laid out. Each chapter is focused on a different area to fit into one of the five sections: the introduction; practical curation (materials); practical curation (reference material and metadata); contexts and perspectives; and broader impacts. I like that the chapters are written all with the same clear structure, sub headings, images and a detailed accompanying bibliography. They provide detailed, expert advice, case studies, and examples of best practice. For me, the writing tone is very professional, almost textbook style in a factual way that provides a lot of information in each section. And as such it is not a light read; possibly a book that you wouldn’t read from start to finish. But you would be able to easily search the index for an area you were looking for, and find the most up to date information written by experts in the field. Although I find more casually written pieces easier to digest and understand, I can actually see myself using this book as a reference for many different areas in the future. The sections covered are detailed, precise, and written by experts across the world. 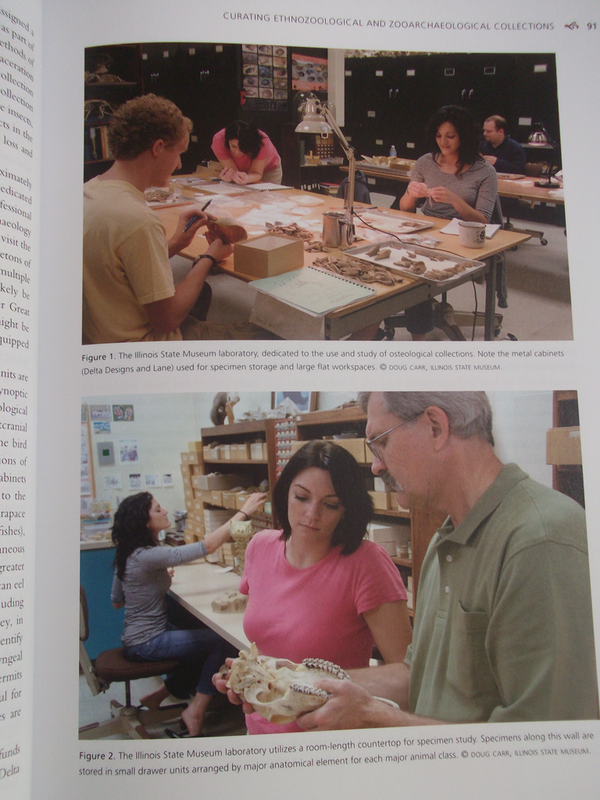 The first section introduces the types of collections that are dealt with, the ethical standards, and the impact of the collections; lots of cross over with natural history collections, as you will find throughout the book. This first short section finishes with a visually impressive summary of the main collaborators of putting the book together; Missouri Botanical Garden, National Botanic Gardens of Ireland, National Museum of Natural History, Paris, Royal Botanic Gardens, Kew, and the Smithsonian Collections. Section 2 focuses on practical curation, starting with including the basics (environmental conditions, pests, hazards, storage, handling, and labelling) to the more detailed, including storing voucher specimens, reference collections (botanical and zooarchaeological), seeds, DNA and even living plant collections. I found this section interesting because of the huge variety it covered and amount of detail in each chapter; if you find yourself wondering ‘how do I curate genetic resources’ then you can easily flick to Chapter 8 to find out. I had not really thought of curating DNA specimens, when we actually have them en masse in natural history collections. There are a couple of chapters in this Section I will take my time to read with interest in the coming weeks. Section 3 looks at the curation using reference materials and metadata. Covering best practice in database standards, cataloguing of collections, and associated photograph collections, these chapters provide detailed guidelines on standardising the information for the future. In short, it spells out the importance of recording everything you know associated with that specimen; from letters/emails to photographs of the sites/collectors, and any associated documents. There is also a chapter on the legalities of biocultural collections, which does cover the important issues of CITES and copyright. The chapter that jumped out for me covered how to store oral history recordings and videos. This may not appear relevant to a natural history curator, but I think it may be getting more and more important: after organising and leading several pop up museums around the city, the amount of stories from local people sparked by seeing a photograph, painting, or mineral, was amazing. I wished I could record them all, because these stories will soon be gone forever. I have several collections where the collectors, or people who knew the collectors, are still alive, and I am keen to capture their thoughts and anecdotes relating to the collections before they are lost. It is a shame Section 4 is the shortest section, as this examines different perspectives on cultural collections. Although not directly related to the hands-on dirty curation work, this section makes you take a little step back and think about the collections we care for. Alongside legal issues, it highlights the importance of respect and building relationships between museums and communities (from the indigenous communities in this book to the communities of amateur specialists for the natural history curator). Many specimens in our stores once belonged to someone and each individual specimen has a story to tell, linking back to the collector. These are the stories that bring the collections to life; forgetting where they have come from cuts any personal link with the visitors. The final section of the Handbook looks at the broader impacts of biocultural collections. We all work with our collections and have a variety of users from the visitors in the museum, artists, researchers, and school groups. However, looking at the different ways different collections are used can invite ideas in using your own collections in a new and exciting way. This section goes into quite a lot of detail about the different impacts these collections have, where there are many cross overs with natural history. The potential for several different research outcomes for biocultural collections are outlined, many of which can be tied in with natural history collections too (showing a closer working between two departments). A separate chapter examines the use of collections for education, which many of us do on a regular basis with our own collections. This Section includes a useful chapter on the uses of herbarium specimens, including vouchers specimens, and DNA analysis. A useful section in the book showing that sharing ideas and ways of working can encourage new uses of collections. I would recommend this book to a museum that holds ethnographic collections, and a bonus if it also holds natural history collections. The book can be used by both areas to help safeguard the collections for the future. It is a Handbook which can be used if you are undertaking a specific collections project or if you updating your database. Clearly laid out with nice images the chapters make available the most up to date information on that area. The book provides a really useful guide to caring for a diverse range of collections many of which a natural history curator cares for too. As there is a lot of cross over, the book can also develop a stronger understanding between departments about the objects and specimens they care for; a better understanding of other curators collections will lead to greater working relationships. When I was asked to review a book written by a twelve year old, I was slightly uncomfortable with the idea, as I thought that I would have to repress my usual critical and negative self and be gentle and considerate with the effort that this young nature enthusiast has put into such work. Needless to say, I did not want to come across as patronising either. However, all my silly tribulations dissipated once I tucked into the book, and I actually found the publication not just faultless but truly enjoyable. Jake McGowan-Lowe’s work is illustrated with beautiful photography and contains a wealth of knowledge and sound advice. Each chapter has images of specimens from Jake’s very own skeletal collection, which ranges from the common British species to more exotic ones like armadillos and leopards. From the first pages one cannot fail to realise that this work was produced by someone with considerable first-hand experience on the topic. Maybe it was the picture of the more than two hundred skulls decorating his bedroom that gave away that the natural world is not just a pass-time for Jake, but something he is genuinely passionate about. For each of the species included in the book, we are given details of some of the most significant skeletal adaptations and in specimens where a pathology is visible, Jake provides a well-founded interpretation. The author does not shy away from using technical names for the different skeletal elements, but do not fear, because if you missed that lesson at school, there is a helpful glossary at the end. It is refreshing to see that Jake uses confidently and comfortably the relevant academic terminology. I was thrilled with this aspect of the editing and hold this as a triumph against those exhibition consultants that underestimate the level of knowledge of museum visitors and keep vanishing academic language from our galleries. You may now picture me taking my hat off to Jake for going boldly where museums used to go. There is no osteological-related material that this studious naturalist cannot write about. 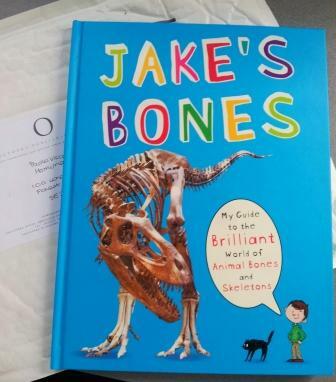 From the basic “what is a bone?” to the more advanced ageing of animals from their bones, Jake displays an astonishing degree of knowledge on everything he presents. The chapters that pleased me the most were the ones on tips for collectors, your bone collection and golden rules. It is easy to be awed by the natural beauty of the objects and their stories, but Jake wisely reminds all that there are a few important things to consider before we start accumulating our very own skeletal collection. Collection management, Health and safety and legislation are covered in these chapters and the author’s style makes it fun to read, so there is no excuse for accidents or incidents. This is a great piece of work which I would recommend to anybody of any age and have no doubt that this will not be the last we will hear from such a talented science communicator.